OK, let’s get honest for a moment. We have probably all shared the disappointment of opening our first bokashi bucket. After 2 weeks of religiously adding your food waste and carefully sprinkling on the magic bokashi bran. We have then waited patiently for two more weeks. During which time we are torn between wanting to have a ‘quick peek’ and not wanting to harm our bokashi microbes by letting air into the bin. So, after four long weeks we are finally allowed to open our bokashi bucket and marvel at the compost inside…… but, wait a minute! The food waste looks almost exactly the same as when I put it in. Maybe a bit mushy round the edges and a bit of white mold on the top. But, other than that, not really anything has changed. Is that all you get? What have my bokashi microbes been doing??? Don’t despair. It may look like not much has happened but in fact there is a whole heap of changes that have happened to your food waste. It’s just that these changes aren’t visible to the naked eye. What happens in your bokashi bucket? You do not get soil or compost directly out of your bucket…. it doesn’t work that way. What you have in your bucket is fermented (or pickled) food waste (also called pre-compost). Fermentation is the process that allows us to throw anything into our bokashi bucket without worrying about foul odors, flies and other pests. The bokashi fermentation process is great for us, but it is also great for our plants (win, win!). The bokashi process is dealing with your food scraps in a way that produces the best possible results for your plants. What do the bokashi microbes do? The bokashi microbes in our premium bokashi bran are hungry and ready to work. Once added to your bokashi bucket they will start to multiply. And if the conditions are right (as they are in our specially designed bokashi composters) they can multiply quickly. So you can quite rapidly have a bin full of bokashi microbes munching away on your food waste. Great, so now you have a bin full of hungry microbes. But how do they help your garden? Food waste is made of lots of complex proteins. These proteins are of no value to your garden in their current form. As the bokashi microbes get to work on your food waste they break these proteins up into amino acids; the small parts of the complex protein chains. Plants, with the help of the bokashi microbes, are able to take up the nutrients in the amino acids. A great analogy I once read compared bokashi composting to a summer picnic. Imagine turning up to a picnic and being presented with two tables. One table had freshly dug up (unwashed) veggies. The other table had a fantastic assortment of prepared salads with all of the cutlery, plates and napkins that you could possible need. The first table is your untreated food waste whilst the second table is your bokashi pre-compost and the bokashi microbes are the knives and forks! I know which table I would choose to eat from! So, it is the microbes in our soil that convert the nitrogen, phosphorus, potassium and trace minerals into a form that plants can use to grow and produce food and flowers for us. Why do the microbes do all this work for the plants? In exchange for a treat! A plant’s roots give off substances that the microbes can use such as sugars and amino acids; a crucial (arguably the most crucial) symbiotic relationship in nature. Does the fermentation process make a difference? What would happen if you just buried your food waste? If you put your food scraps into a traditional compost pile or buried them straight into the ground they would (eventually) become soil. However, the process takes longer. During this time many of the nutrients could be leached out and much of the carbon in the compost could be lost to the atmosphere in the form of methane and carbon dioxide. And don’t forget, those bokashi microbes allow us to be a bit lazier and throw everything into our bokashi composters without the risk of attracting pests. Putting all of your food waste into your traditional composter is often an open invitation to local pests. By fermenting your food waste, the bokashi microbes produce a variety of beneficial substances including enzymes, vitamins, amino acids, trace minerals, some plant hormones, and organic acids. In addition, the acidic environment created during the fermentation process helps control pathogens and damages seeds. So, even though your food scraps may look pretty similar after 2 weeks in your bokashi bucket, your bokashi microbes have been hard at work. Your thriving garden and healthy plants are testament to the benefits of bokashi microbes and fermentation. Hi, still confused with making of bokashi. You did not, to me, give the answer to the question; after two weeks of time when the person opened the bin the food scraps were still kept their shape, not being melted down. My question is what to do after 4-6 weeks with the bucket full of undigested food scraps? mix it with soil? Your knowledgeable answer would be appreciated. Thanks for the question. So the first two weeks is spent adding your food waste and bokashi bran in layers to your bokashi bucket. Then you leave your sealed bin for two further weeks (whilst your food waste completes the fermentation process). At the end of these two weeks you bury your fermented food waste (or pre-compost, as it is called) directly into your soil (the trench method), into your compost pile or into a soil factory (basically a large rubbermaid container used to make compost). After another 2-4 weeks the pre-compost will have broken down into your soil (compost pile, or soil factory) to produce nutrient and microbe rich compost. I hope that helps. Do not hesitate to ask if you have any other questions. Loving your bokashi bucket. The only issue I had was the spigot became loose which I remedied by retightening it. I keep the bucket in my guest bathroom and some of the bokashi tea leaked (and absorbed) on the hardwood floor. My bathroom smells no matter how many times I wash the floor. Any ideas on how to remove the smell? Great to hear that you are loving bokashi composting and glad you were able to reattach your spigot (there is a tendency to overtighten the spigot which may cause it to become unthreaded and leak, but, as you found, it is fairly quick and easy to fix). In terms of the bokashi tea smell, we have found that the odor does eventually dissipate. However, you may want to try sprinkling baking soda on the area (or leaving in containers close in your bathroom) to help absorb some of the smell. Are bears, raccoons etc. Attracted to the fermented food waste once you have dug it into your soil. Animals are not attracted to the fermented food waste. However, you may find that inquisitive animals (such as raccoons and foxes) may dig around in your newly buried pre-compost (in the same way that they may dig up any newly disturbed soil). A piece of netting held down by a few stones is usually enough to distract them from digging. Is there an upper and lower temperature range at which the pre-compost must be maintained to keep the process working. I live in central Texas where outside temperature can be quite extreme. Whilst filling and fermenting the food waste, the bokashi bin should be kept around room temperature for the bokashi process to be successful. However, once it is transferred to your garden, then temperature is less important. In cold temperatures, the microbes and life in your soil will become less active and you may notice that the bokashi pre-compost takes longer to break down. 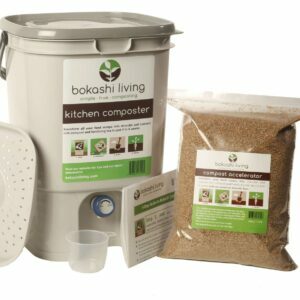 Can u put the bokashi in a tumble compost bin to help break down what’s in the bin of leaves ? How do I dispose of failed batches? I had a couple of buckets get green mold in a very hot climate and I’m not giving up, but websites just say to “discard” failed batches, not saying where or how. Can I bury it in my garden, or will it harm the soil and I have to bag it in trash bags and send it to the landfill? Yes, hot temperatures can kill the bokashi microbes and cause the bin to fail. Try to keep the bokashi bucket around room temperature and out of direct sunlight. 1. Place it in your green organics bin for pick up at the curbside by your municipality. If you don’t have a regular pick-up you may be able to find a local drop-off location for food scraps. 2. Bury it in your garden or compost heap with a generous handful or two of bokashi. Leave it for 4-6 weeks and the good microbes in the bokashi and the soil biota should be able to break it down. Don’t plant on this area of soil for 4-6 weeks after burying the failed bokashi load. 3. Lastly, put the contents of the bin in the garbage. This may feel wrong after putting all the effort into filling the composter and using the bokashi but don’t lose heart. Instead think about all the lovely nutrients and microbes that you have (and will) add to your garden.